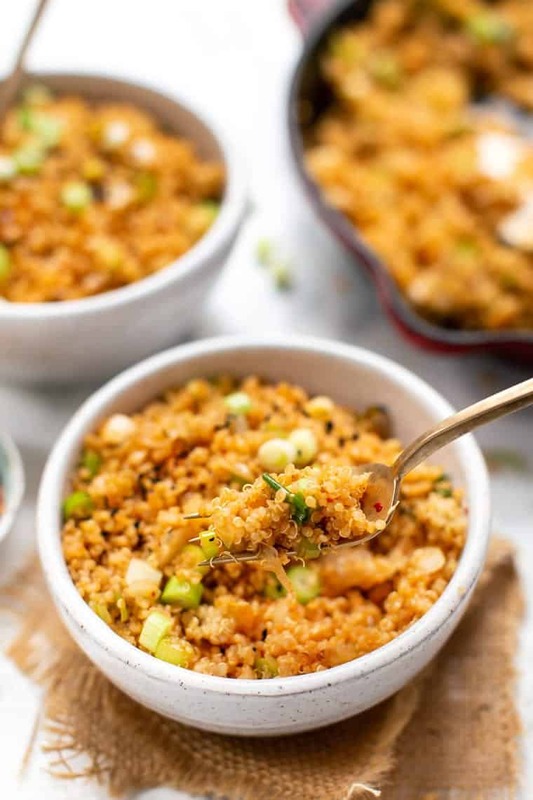 This easy kimchi fried quinoa recipe uses just 5 ingredients and is ready in less than 10 minutes. It's a perfect side dish or used as a base for stir fry! 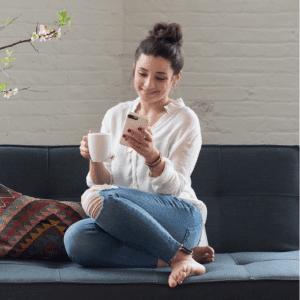 We're all about quick and easy here at SQ. 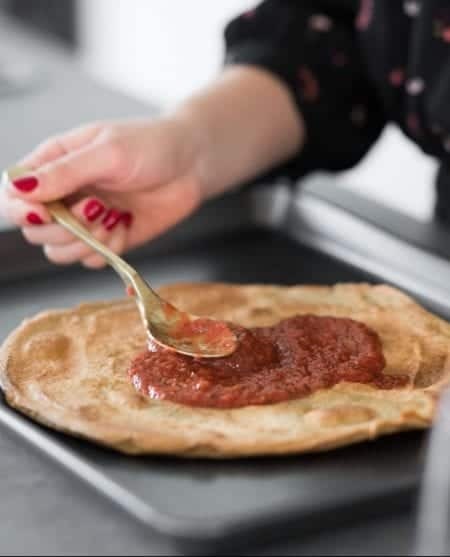 So when things come together in under 10 minutes and use just 5 ingredients, you know it's a keeper. Today we've got just that. 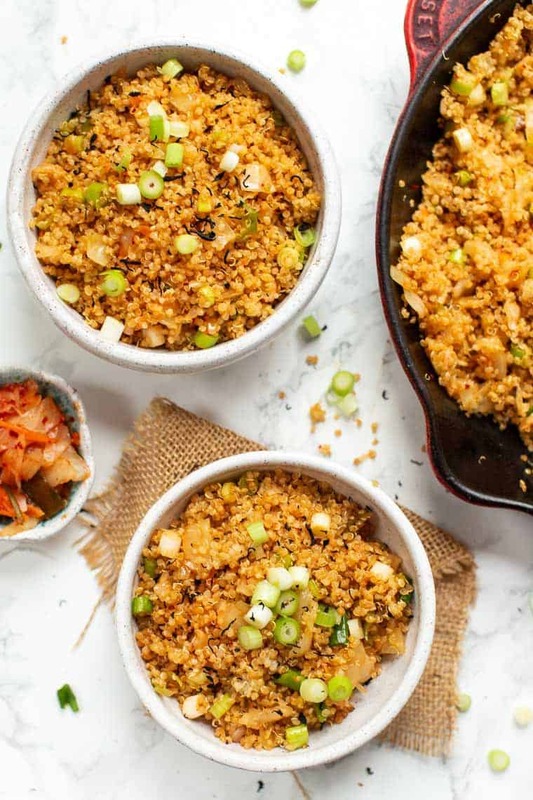 A recipe for kimchi fried quinoa that is crazy simple and crazy fast. Whether you're looking for a tasty side dish, want something new to serve with your favorite stir fry (because let's get real, white rice can be pretty dang boring), or you just have some kimchi that's been sitting in the back of your fridge and you don't know what to do with it, this recipe has you covered. First, let's talk kimchi! Kimchi is a classic side dish in Korean cuisine that is made by fermenting vegetables in a spicy Asian-inspired seasoning. To me, it's a more interesting variation of sauerkraut. Kimchi is one of those foods that has been dazzling the health world for the last few years. All the health experts love it, but I don't think it has quite broken through. Because kimchi is fermented, a lot of people find it a bit funky tasting. Hence why you might have a half eaten jar sitting in the back of your fridge. Plus, once you get used to the taste, it's pretty freaking delicious! 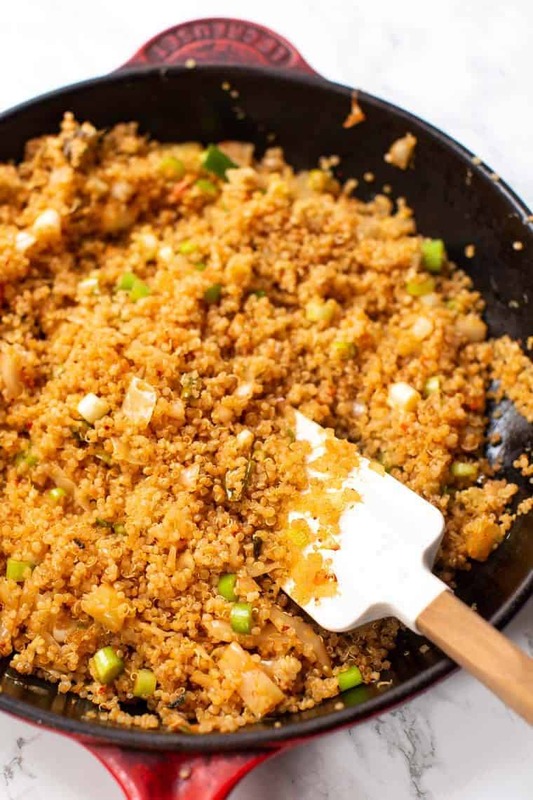 Making fried quinoa is actually really simple. You're essentially just sauteeing cooked quinoa with whatever other ingredients you want so it gets a little crispy. 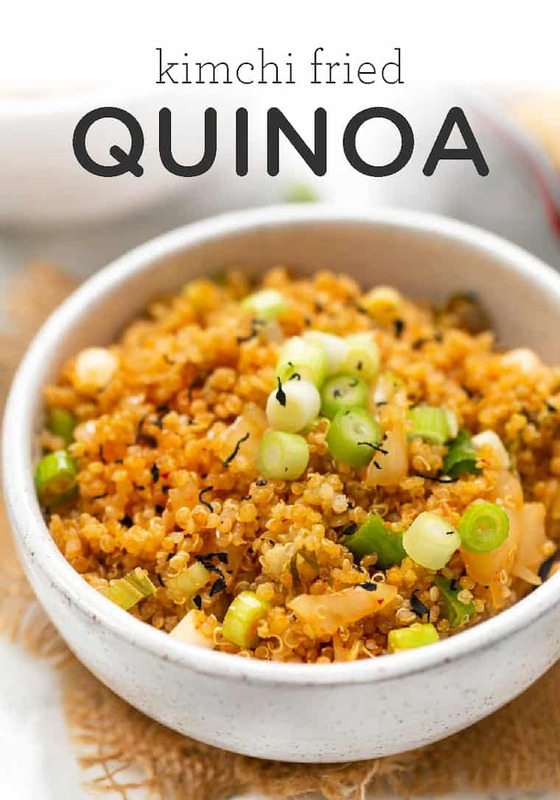 As long as you've got cooked and cooled quinoa, this won't take any more than 7 – 8 minutes to cook. 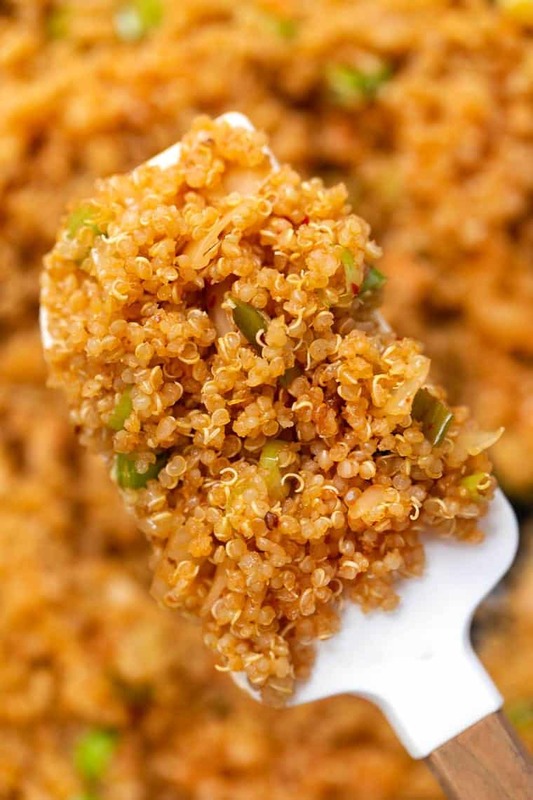 What's great about quinoa is, similar to rice, that it's got a pretty plain flavor. That means no matter what you put with it, it will soak it all up. 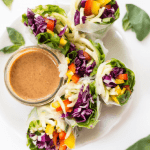 For this recipe, we're keeping things on the Asian-inspired path and using toasted sesame oil for cooking and wheat-free tamari to add some umami flavor. The, of course, we've got the kimchi and some fresh green onions to finish things off. Kimchi: you can choose any variety you'd like, but make sure it's vegan if you are following a vegan diet! 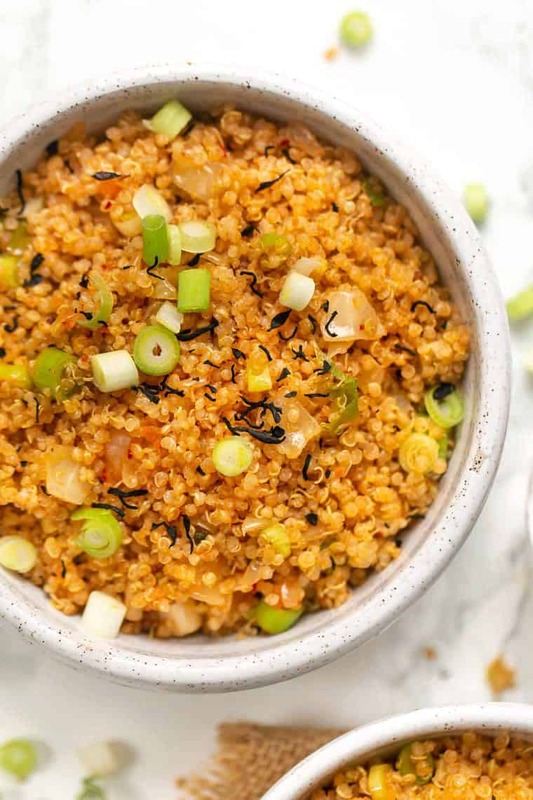 Wheat-free tamari: my favorite way to salt Asian-inspired recipes! And in less than 10 minutes, it will be d-o-n-e! I personally love this dish on its own, but as I mentioned earlier, it also makes a fabulous side dish. Since we are using Asian-inspired ingredients, I would recommend pairing it with other dishes/ingredients that are typical to those types of cuisines. Or again, just as a simple side dish! 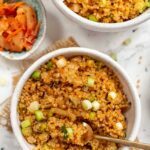 This easy kimchi fried quinoa recipe uses just 5 ingredients and is ready in less than 10 minutes. 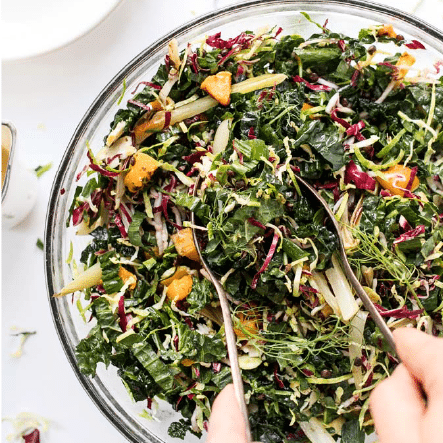 It's a perfect side dish or base for stir fry! Heat the oil in a large skillet. Once hot add the quinoa, kimchi and 2/3 of the green onions (reserve some for garnishing). Saute for 3 minutes until the quinoa starts to brown and add in the tamari. Cook for another 3 - 4 minutes, then divide between bowls and enjoy.